Group Leader Transformation and Metastasis lab. Response: Thousands of cancer patients worldwide are taking RANKL inhibitors for the management of bone metastasis, based on the key role of RANKL and its receptor, RANK, driving osteoclastogenesis. RANK signaling pathway acts as a paracrine mediator of progesterone in mouse and human mammary epithelium. RANK expression is associated with poor prognosis in breast cancer even though its therapeutic potential remained unknown. Complementary genetic and pharmacological approaches demonstrate that therapeutic inhibition of RANK signaling drastically reduces the cancer stem cell pool, decreases tumor and metastasis initiation and enhances sensitivity to chemotherapy in mouse models that closely resemble the clinical disease. 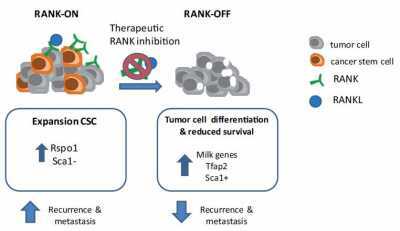 Mechanistically, genome wide expression analyses showed that anti-RANKL therapy promotes differentiation of tumor cells into milk-producing cells, as observed during pregnancy. Response: Findings show how neoadjuvant therapy with inhibitors of RANK signaling can provide a differentiation therapy in breast cancer, through the depletion of cancer stem -like cells, extending the use of these inhibitors beyond simply the management of skeletal-related events. Response: RANK enhances hallmark capabilities of tumor cells, mostly described in the mouse mammary epithelia, increasing proliferation and stemness in early steps of mammary tumorigenesis and enhancing survival and migration in neoplasic cells. Before translating these results to the clinic, they need to be validated in additional mouse and human breast cancer cells and models, and in clinical trials. Response: Considering that inhibitors or RANK pathway are already in the clinic it is essential to demonstrate whether anti-RANKL treatment in human breast cancer and other tumors has benefits beyond the management of bone metastasis. 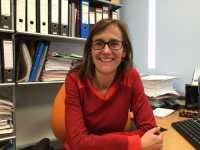 This entry was posted in AACR, Author Interviews, Biomarkers, Breast Cancer and tagged AACR, Biomarkers, breast cancer by Marie Benz MD FAAD. Bookmark the permalink.